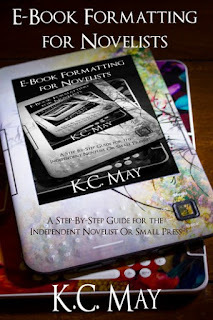 Notes: From time to time I like to check what other independent authors have suggested for formatting of e-books, just to see if I can learn something new. This particular e-book is more than a few years old, so it might be out of date, but perhaps there's still something to glean here. Besides, this one if from fellow fantasy author K.C. May, and I've been meaning to read something of hers for years (if you're reading this, K.C., I promise I've got some of your novels waiting for me on my Kindle -- there's just too many things to read! -- but I'll get to them, promise). Mini review: Now that I've read it, I wouldn't say this one is outdated, but I never understand why nearly all authors focus upon coding with HTML and such for their novels when their are much simpler ways of formatting for e-books. Or, at least those simpler ways have worked for me and I've never had a single complaint from readers. But to each their own. That being said, K.C. does bring up some elements here which hadn't occurred to me of late, mostly related to design quality, and I'm thankful for that as it's given me something to think about.